Appreciate Your Life asks students to practice evenness of mind. Here is the first major collection of the teachings of Taizan Maezumi Roshi (1931-1995), one of the first Japanese Zen masters to bring Zen to the West. These short, inspiring readings illuminate Zen practice in simple, eloquent language. Topics include zazen and Zen koans, how to appreciate your life as the life of the Buddha, and the essential matter of life and death. 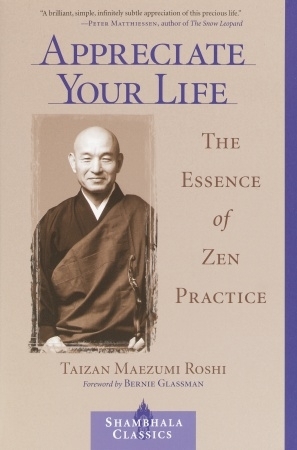 Appreciate Your Life conveys Maezumi Roshi's unique spirit and teaching style, as well as his timeless insights into the practice of Zen. Never satisfied with merely conveying ideas, his teisho, the Zen talks he gave weekly and during retreats, evoked personal questions from his students. Maezumi Roshi insisted that his students address these questions in their own lives. As he often said, "Be intimate with your life." The readings are not teachings or instructions in the traditional sense. They are transcriptions of the master's teisho, living presentations of his direct experience of Zen realization. These teisho are crystalline offerings of Zen insight intended to reach beyond the student's intellect to her or his deepest essence.